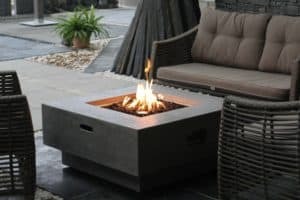 Firepits and Chimineas Patio heaters provide a cosy heat that allows you to enjoy alfresco dining and drinking long after the sun has gone down, we provide gas patio heaters, electric patio heaters as well as chimineas and firepits. Gas Patio Heaters All our gas heaters are manufactured by reputable companies that are leaders in their field in design and quality. Outdoor Gas Fires Our Chimineas are genuine mexican chimineas (the only and original) and come in sizes and colours to suit your own personal choice. They are also great gift ideas for a family memebr or that person that aseems to have everything. 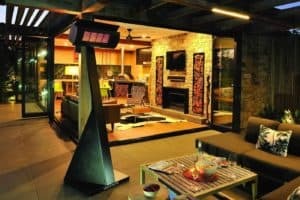 Outdoor Electrical Heating In addition to this if you prefer electric heating we have permanent wall mounted solutions that are triggered with the flick of a switch. Customer service guarantee The Outdoor Scene's friendly and well trained staff are always more than happy to explore all your barbecue and outdoor cooking options. The Outdoor Scene takes great pride in our attention to detail and meticulous customer service. The Outdoor Scene also services the hospitality industry and other trade industries. Any commercial business enquiries are very welcome. Nationwide Delivery available Nationwide delivery is offered on all outdoor heating. The Outdoor Scene also offers assembly services for local Dublin area customers. Browse the extensive catalogue online now at Outdoor.ie, and buy online securely, safely, and with prompt delivery to anywhere in the Republic of Ireland.